What a gorgeous day here today! And, I am sticking to the 30 day yoga challenge, so things are going pretty well. Today, I finally photographed a master bedroom renovation in Roswell that I did last fall. This was one of my favorite projects to work on because the colors were out of my wheelhouse, and the transformation was dramatic. Plus, the clients are fabulous. My first instincts were to lighten everything way up, and put the bed on the opposite wall, so you see it when you walk in. The walls just had to be white, with splashes of bright red and aqua. The couple wanted new hardwood floors to match downstairs, and are drawn to deep reds and light blues. They also wanted to incorporate a stained glass window that they picked up years ago, but never really found a home for, and a special vintage vanity that belonged to her mother. All of the mahogany furniture was staying. The headboard wall was paneled in in 1x6 tongue and groove boards for freshness and texture. 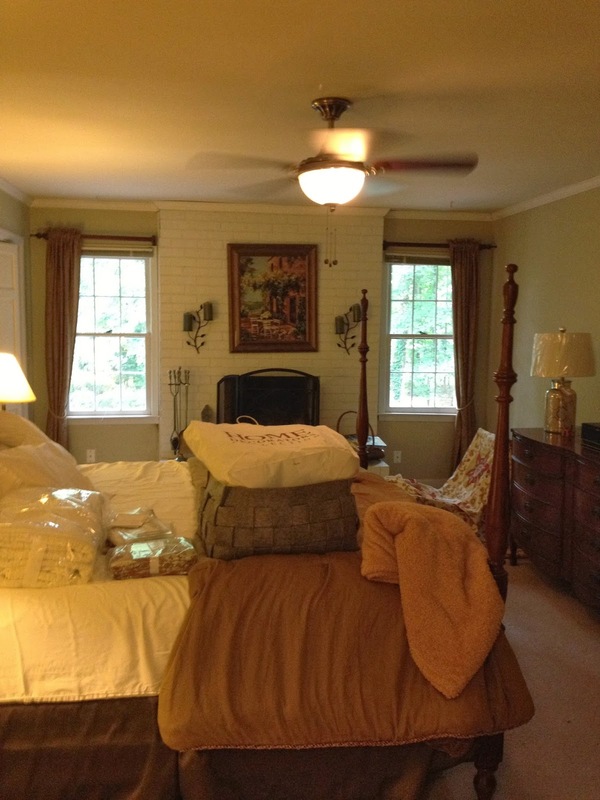 We whitewashed the entire space in Benjamin Moore White Dove, and painted the ceiling Topsail by Sherwin Williams. The pewter pulls are original. The vintage mirror came from my booth at the Queen, and as luck would have it, Cherilyn had the adorable vanity stool in her booth in the exact red as the vanity! 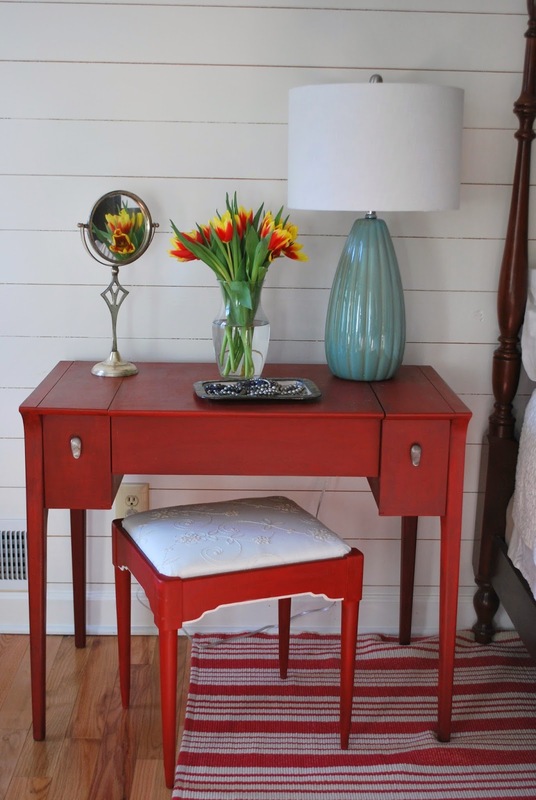 The lamps are all from Home Goods, and the rug is Birmingham Red from Dash and Albert. Above, you see the inspirational stained glass window front and center. 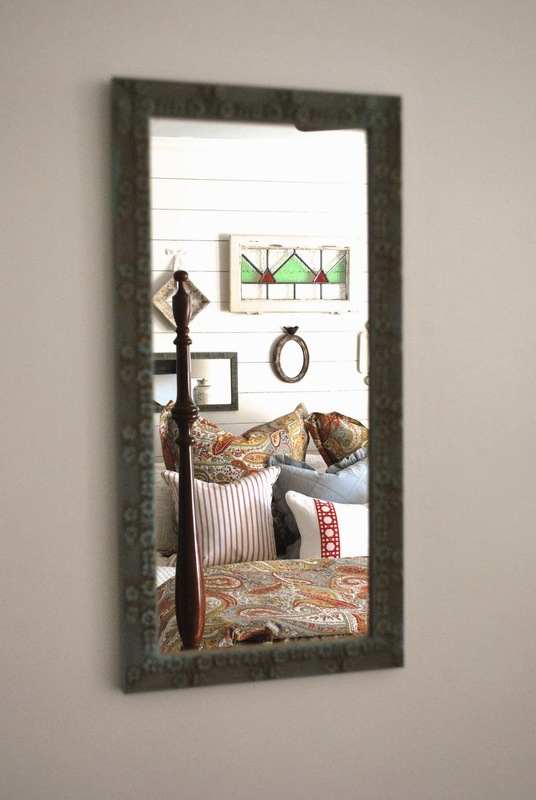 The collection of vintage mirrors came from various dealers at the Queen of Hearts. The bedding is a mix of Pottery Barn, Home Goods, and custom pillows available at my booth, or by request. I was feeling like there was too much heaviness in all of the brown furniture, so they graciously agreed to let me paint the bow front dresser in Duck Egg (sorry about the goofy lighting). 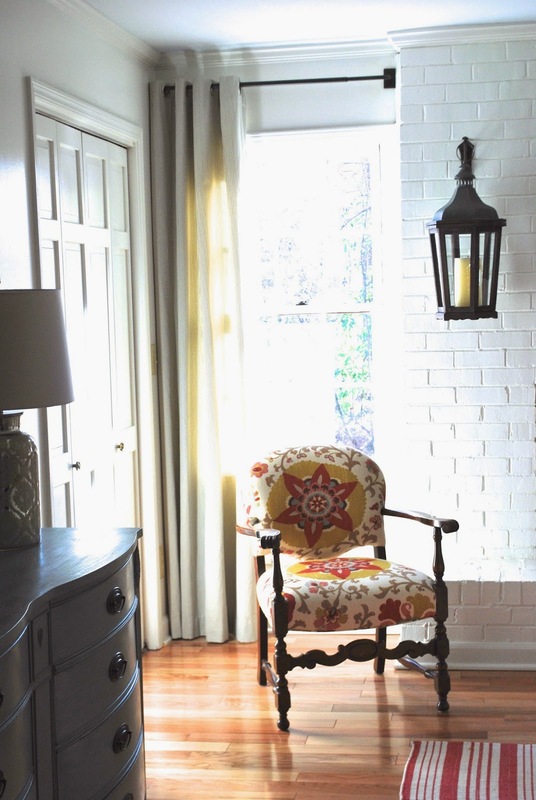 Custom canvas pinstripe drapes were installed, and her vintage chair got a new life in a punchy Suzani print. The lanterns flanking the fireplace are from Pottery Barn. Closeup of my striped and lattice trim pillows, above. I also have these in blue and teal. 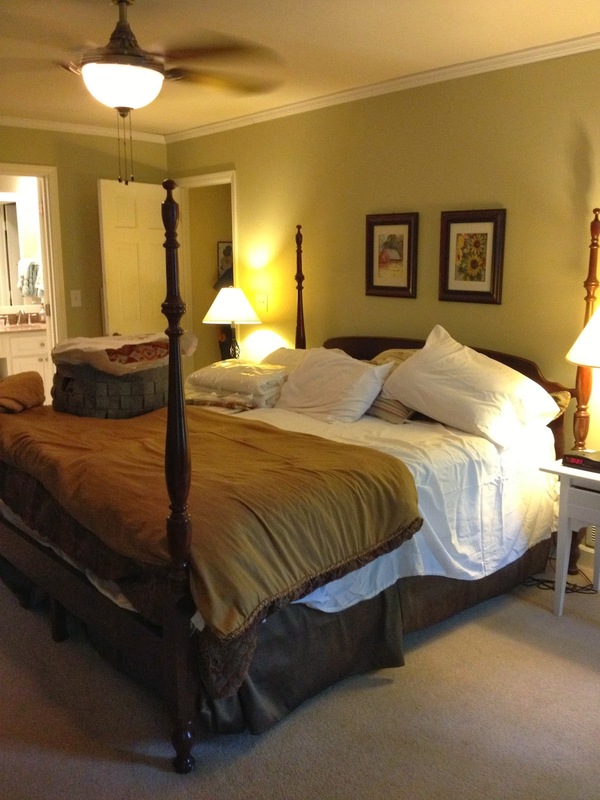 If you would like help designing a master bedroom renovation in your home, I would love to hear from you! Please contact me via email at lisagabrielson@att.net. Perfect! Luv the way you blended all the different woods. Painting some, leaving some natural. Beautiful room! So pretty Lisa...I adore your style! 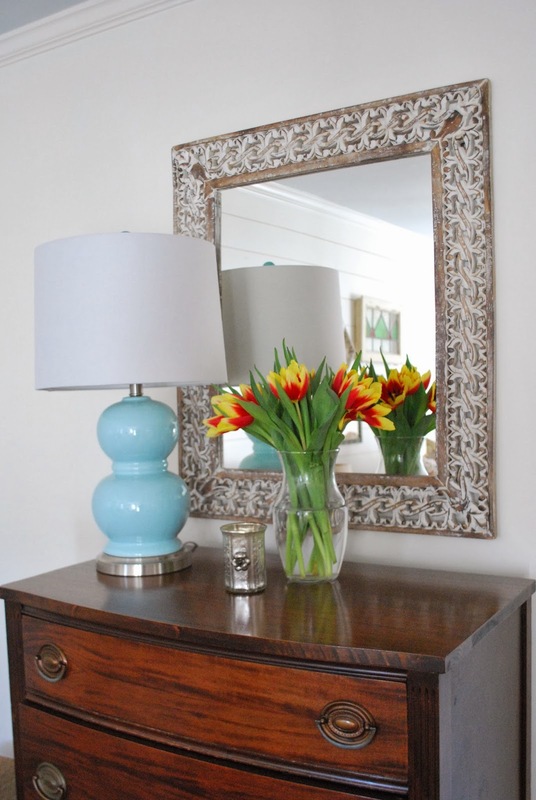 Love the colors and the way you added texture to the room!